All Hail the mighty checklist. 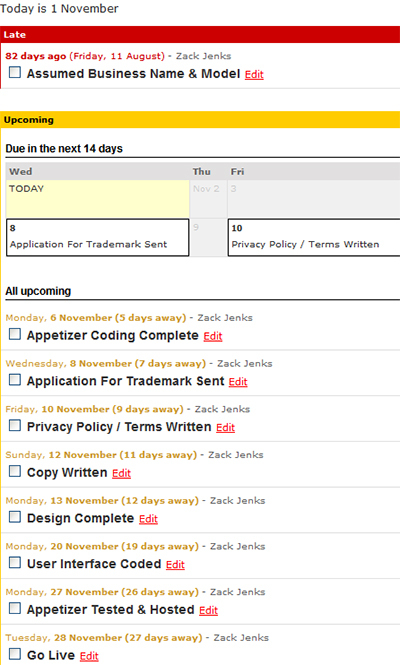 With deadlines galore I don’t envy you the work but the sense of satisfaction you’ll have in 22 days 1 hour and 52 minutes (as I write this)is something I most definitely will envy and hopefully the day to day checking of this site will continue to pay off in motivating me to get things done. Wow, a review would be very much appreciated Chris, thanks :). I wasn’t planning on doing any beta testing with this one, but I may reconsider if need be. What I had hoped was to have ample time to test it on my own (yeh right) and not push the testing to my users, but I am starting to reconsider this notion and it’s looking more and more likely. I’ll keep everyone posted if and when that happens. Thanks for checking in regularly Chris, it’s good to have you here. If I help motivate you in any way, that’s great, that’s what this blog is all about! Good luck on your venture.